San Diego Comic-Con is barely underway, but so far, it is the horror movies that are winning out. Fox brought a nice showing for Kingsman: The Golden Circle today and both the DC Extended Universe and Marvel Studios are going to be rocking Hall H on Saturday, but New Line Cinema has absolutely crushed it so far with their offerings. During preview night, they hosted a "Scare Diego" event. During the event, they screened the first ever teaser for The Conjuring spin-off The Nun, which sounds absolutely terrifying. 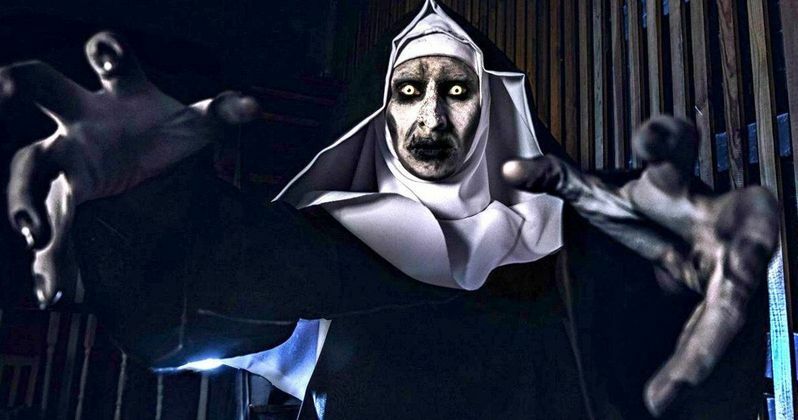 "Start praying San Diego, because no one is safe from the unholy terror that is...The Nun,"
Since the movie is still nearly a year away, the teaser trailer for The Nun that was shown didn't sound overly long, but it does sound effectively creepy And yes, the footage did give the crowd a look at the creepy nun Valak, who was a last minute addition to The Conjuring 2 and wound up getting her own spin-off movie. Per Deadline, here's a description of The Nun teaser that was shown at San Diego Comic-Con. "The teaser, which is expected to drop next week, showed Taissa Farmiga's Sister Irene waking up in a Roman monastery and wobbling around to find a group of dark cloaked figures praying before an altar. One of them arises and it's a nun's shrieking demonic face." Ever since The Exorcist, there is something truly terrifying about mixing religion, like nuns and/or priests, with horror movies. So The Nun is setting itself up for success in that respect. As mentioned in the footage description, Taissa Farmiga is starring in The Nun and is reportedly the lead. Her older sister, Vera Farmiga, plays Lorraine Warren in The Conjuring movies, so some wondered if there was going to be a family connection there in the movies. According to the report, the characters are not related. At least that's what the studio is saying right now. We could be in for some sort of reveal with that. Also appearing in the movie is Charlotte Hope and Demian Bichir. Annabelle: Creation is getting some more solid buzz out of SDCC, with The Nun footage adding to the good faith that The Conjuring cinematic universe has going for it. The Crooked Man also has a spin-off in development. Not to mention that New Line's footage from IT is arguably the most buzzed about thing from Comic-Con so far. They are crushing it.